Science & Sensors Technologies® developed a low cost multi-point/multi-parameter optical fiber sensor that can be used to determine a wide variety of measurands such as strain, pressure, temperature, chemical impurities and position of a fluid interface. This device uses unique side illumination technology, FOSense™, that allows the use of low cost light sources, of any wavelength and size. This produces a very high spatial resolution device having a high density of sensing points along the fiber length. With light sources as small as 5 mm, it is possible to accommodate up to 10 sensing points for every 5 cm of fiber! This device can be embedded into a solid structure or immersed in a fluid to make virtually any type of measurement. 2. LED(s) and power source. 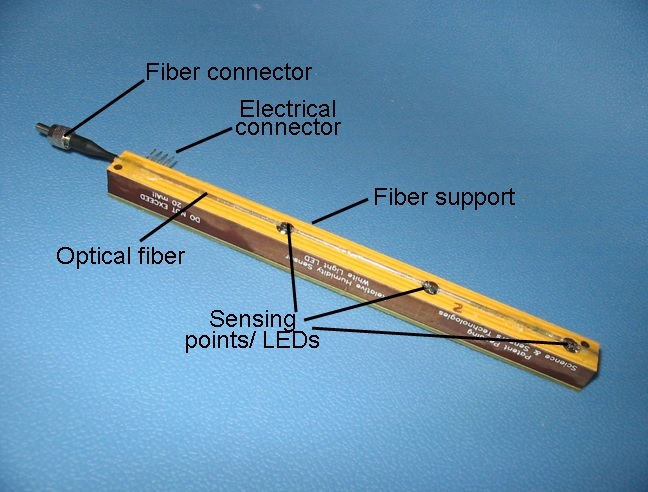 A prototype fiber sensor, 23 cm long, with three sensing points, is shown in Figure 1. The optical fiber is mounted over a plastic support which can house a large number of LED light sources. These LEDs side illuminate the fiber to probe different sensing points along its length (see Figure 2). After this light passes through the cladding, it is detected by either a light meter or a spectrometer. 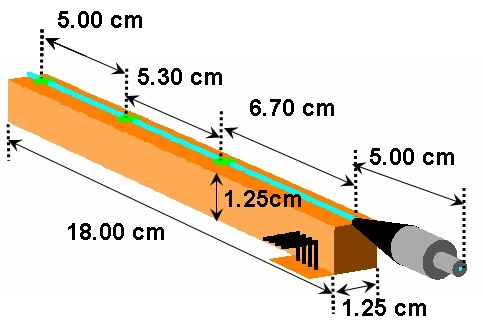 Figure 3 is an illustration of the dimensions of our optical fiber sensor. Phosphate ion (Resolution: 300 ppb). Nitrate ion in water (Resolution: 300 ppb). Liquid Level (Resolution: 3 microns). Many other types of sensors are possible including CO2, strain, Methane, Arsenic, Chlorine, temperature, Total Organic Carbon (TOC), etc. Multiple parameter detection in a single fiber or in a single sensing points. Patents of this sensor have been issued in the US, Europe, China, Japan, Mexico, Russia, Australia, Philippines, Singapore and New Zealand. We have several other patents pending. Technology transfer assistance may be provided with a license. A proof-of-concept test program is also available.